Vocal Type: Difficult to ascertain at this transitional period. Vocal Pluses: Justin Bieber 's midrange is where the voice finds its most comfortable and consistent tone, which has a slight huskiness to it. This "comfort" stretches to the bottom half of his belting range, which is bright and with a cool colouring. He also has the ability to sing in a warm, breathy falsetto, that he can switch to and from easily. Justin Beiber is able to utilise vocal runs, and to hold and maintain a note without issue. Overall he has a light voice, that has a pleasant, slightly nasal, tone. Vocal Negatives: The voice lacks resonance and power. surely its hard to define his vocal typing,but it his voice didnt change too much,he should be a treble(boy on the times of puberty that didnt change the tone much).should he be a baritone after puberty ._. ?the voice deepens a lot after puberty,so he would be turning into a baritone,or maybe a tenor,you know,i just think he has hormonal problems,then it took more time for his voice to deepen. i personally dont like his falseto,its tooo nasal,sounds like britney spears(LOL! ).i personally think his range is a lot nasal as a whole,meaning his belting was not trained in the way it should have been.seriously?he is miserably trying to sing as a countertenor,i think. I personally find his voice is quite sore on the ears, his last one I heard was his version of 'All I Want For Christmas' with MC! His voice just sounded autotuned and like nails being scraped down a blackboard. its because:he is losing his range xD,then mantaining the fuller tone(even if his voice doesnt have a full tone at all)gets a lot harder.that's not a countertenor(or high tenor) voice...belive me,im a countertenor,and i hit up to F6,my voice was never like that xD,that's a child's voice that did not maturate yet e_e,then he should stop singing by...now,or change his style,oh,by the way,there is another option: taking girl hormones LOLOLOLOLOLOLOLOLOLOLOL,or just heavy autotune and lots of playback.and,he ruined all i want for christmas ._. Lol. You sir, have an agenda with your vocal fach placing! To be fair though, I am no expert on Justin Beiber. I only know "Baby" and his Mariah duet... My points were made strictly on what I heard on the profile video. I really shouldn't even be trying to place him actually...seeing as I dislike him to the point of staying as far away from his material as can possibly be. My heart literally stopped when I saw this article and I was like...whyyyy diva??? WHYYYYYYYY! If he hasn't reach puberty, it's safe to say he's still a treble which is vocal style used in kids. But recently I heard his voice, he sounds like a countertenor to me. Dude! LOL! Don't worry though if you released a 4 minute single of you farting I would buy that over Justins records! But without trolling on the poor guy he clearly has something that people buy into, maybe once his voice has passed fully through puberty and he manages to adopt a naturally adult sound he might get better. But there is no forgiving him for what he did to All I Want For Christmas...period! Right? I mean his voice has no real substance. Its basically a commercial product with nothing to really stand out. I can't stand voices that have no character. its because of the posing :/.most "girls" like him because its "cool" to like him,and thats all.most fans say "OMG I LOVE BIEBER" and other stuff like that just to seem like if its "cool" to like bieber,as if he was like "the best singer in the world".that's so dafuq ._. i dont like the way he fakes a countertenor voice,dont like the stoopid(LOL) fans.seriously,dafuq is this guy/girl xD? LOL yeh one day those 'Beliebers' will grow up and realise the cruel truth they have been had! He needs some serious lessons, not just in singing but also in media situations as when he does age that posing will only make him look more ridiculous as time goes on :S Its gonna be cringeworthy to watch I feel. If that isn't all thanks to studio wizardry, maybe he's a tenor? "Transitional period" HAHAHAHAH that sounds so sharp. I love it. If you listen to "Boyfriend" I think he's finally transitioned. It's an instrument. But he is a tenor, the lows in the beginning are pretty weak and a bit forced. Yeah, right. Not to offend you, but the album was a flop! Even trying to name it like Cher's album thinking that the stupid people would buy it. Now he wanted to make an album with One Direction as they are the popular ones and are new material, unlike I'm, a failed singer, failed guy...a huge FLOP! Firstly - he definitely extended his voice with low notes (I am not able to tell the exact names for those notes, but difference is quite noticeable). These have warm, pleasant tone and can be heard (whispered, though) in "Boyfriend" and song called "Right Here" - http://www.youtube.com/watch?v=v5UvS_Lc5Aw&feature=relmfu - worth mentioning - first verse is actually sang by Bieber, not Drake. Thirdly - the voice overall has gained a richer tone, less nasal and sounds more mature. Negatives - He's got serious trouble with mixing chest and head voice. This performance http://www.youtube.com/watch?v=7xs_mGv_NiY shows clearly he can't decide, whether to shout or whisper the notes that appear to lie on his bridge or slightly above - and it's definitely the matter of artistic choice, 'cause he struggles to actually sing them. He also doesn't have full control over his lower register, (see any live performance of "Boyfriend"), those notes are reached via improper technique, have very airy quality or aren't hit at all. Voice still has somewhat childish tone, especially head voice at its highest. I can't believe you have Justin Bieber on your website before other male artists. I am shaking my head in real life. Truly sad. DD can make whatever profile he wants to. There's nothing sad about it. If you scroll down and look at the comments you'd see that he did it as a favor to a friend. I actually enjoyed reading this profile. I don't see it as any different than having a profile for Katy Perry or Rihanna, hahaha. I think his voice has finally transitioned into a tenor. Yes, I think he's a tenor post-transition. Not even a countertenor his voice is really hard to make out. But he is not a countertenor I'm a countertenor I span 5 octaves and 5 notes C2-G7. so how high can he hit now without flipping into head voice or falsetto ? g4? Uh oh, fangirl alert. Let the ones who know speak child. You step aside. i really think you should do one on Jesse McCartney. He is a very solid singer! 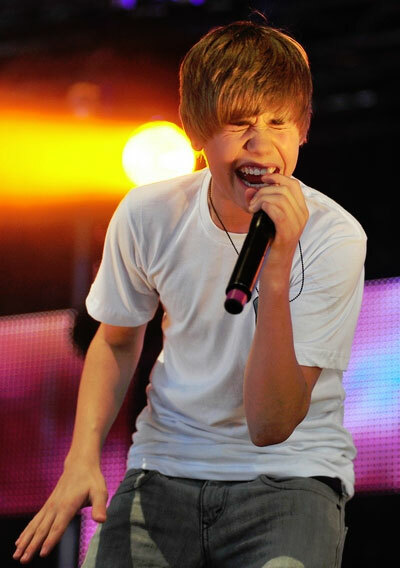 Almost always sounds flawless when he performs. If Bieber was worth a review I really think Jesse does! He's pretty underrated. He's no Luther, Tyrese, John Legend, type guy. But he has some beautiful riffs and runs. And his stamina live is amazing. All of these artist now can barely walk across the stage without being out of breathe. Could be do to the tedious practices back in his boy band days with all the dancing (they actually got on the ground, and Jesse would be the only one to literally RUN from one end of the stage to another to high five and all the fans. And he was young and developing then, but he held his voice control VERY well). And he can do multiple songs in row that dont have a lot of breaks and keep his breath up the whole time. Bieber looks like a constipated baby in that pic. I would like to Say Lyric Baritone but his tessitura is so high and his timbre isn't all that dark. And it's not like he's even gone to the 2nd Octave. Baritones, developed or not should at least have an expectancy of a 2nd octave B Flat. While his voice is still maturing, he's a Tenor at the moment. A Lyric one at that. I doubt he's a spinto tenor. Aren't they usually able to make great volume? I don't think he can be heard without a microphone. Even in recent studio tracks he hasn't been able to reach notes in the 2nd octave, so he must be the highest kind of tenor possible, like Bruno Mars. He's not even close to a baritenor, if it wasn't because having a femenin timbre is a requirement, I'd say he's a countertenor. Baritenors, even when undeveloped, should be able to reach way lower than the Bb2 you mentioned. Just as an example, I'm a light tenor and before I started to get singing lessons I could already hit a G#2, so a baritenor should be able to reach lower. I think he is light-lyric tenor. I don't know much about baritones but most baritones can reach the 1st ocatve (without projection). By the way, do you have good ears for notes? I'm trying to guess some notes of some songs but I'm terrible at it, do you think you could help me? I have a decent ear. But are they hitting those Es and D's while projecting or not? And I though Michael Bible was a full on lyric tenor. Pitch IMHO doesn't necessarily determine voice type anyways. Mainly, passagio, tessitura, and color. I'm a mid to low tenor and can dive into the first octave but can't project past A2-G#2. They don't sing classically, so it's without projection. Michael Buble is classified everywhere as a baritenor (Lyric, though) that's why I put him as an example. And yeah, of course pitch doesn't define your vocal type as much as color, weigth and all that jazz, but if for example you se a man who cannot go under C3 like Justin Bieber's case, then you don't need to hear him to know he's a tenor. The baritenors I was talking about are not expert singers, their range is not much large than 2 octaves, while your range, if I remember well, was from A1-A5, which is twice longer. I underestand that if someone has a 4 octave range and doesn't reach the 1st octave it would be rare that he was a baritenor, but for a two-octave ranged person I guess it's not that rare. About the notes, would you mind checking this two songs please? I want to know how low can the two singers go. Rachelle hit a F#3. The black boy hit a G2/F#2, gotta listen again. he was quite dark. The black boy is definetly a bass for what I've heard both in his spoken and singing voice. And yeah, I do sing. I started about a year, but since I had no money I had to train myself. The problem? In that time I was obsessed with Christina Aguilera and tried to imitate her way of singing, so you can imagine how it ended xD I started to take lessons six mothns ago and I've improved quite a bit. I'm just the opposite to your friend: my talking voice is quite low for a tenor, which makes my tessitura to be strangely low for the light timber I have. Even my vocal coach has trouble reaching the low notes I can (He's a light lyric tenor). The strange thing is that I can reach the F#2 like it's nothing but then it's almost impossible for me to reach the F2. My voice is a bit strange to say the least. My voice is steadily maturing and sounds quite a bit different from when I first turned 16. I wonder how my voice will solidify when I turn 18. LOL. Right now, my voice just sounds undeniably warm. For me, I generally sang in a nasal approach becuase I felt my sense of warmth was rather mechanical and robot sounding, but now when I sing in my natural tone, it sounds like a very pleasant and smokey warmth with modest weight and a dark color. My rasp however makes me voice sound much thicker than it is. My belting register, which is my strong suit I might add, still has quite a color contrast. Naturally, it is steely, piercing, bright, and has a huge bight to it. As of lately, I can take the weight of my lower register up to my highest belts without much issue apart from the occasional passagio issues. Desipite, the steely color and my grand volume capacity, I still can sing quite softly and even carry the warmth of my belting register up into my lower belts (prior to G#4(IMHO, a tenors G4 is the equivalent of a mezzo-soprano's C5)). Yeah... Kinda late for that advice, but I've already learnt the lesson xD Right now I'm looking up to this guy http://www.youtube.com/watch?v=PfAh3uDXWEo and to Bon Jovi and Amy Lee as well. I guess for that comment that we're the same age, so I'd like to ask you: did your voice change even after the usual voice change at 13? I mean, I was one of the first ones (If not the first) in my school to change my voice, and it had a quite dark colour, it was even lower than Michael Buble's. Then, when I started taking lessons my vocal coach said I was a tenor, which really surprised me, but when I heard my voice on recordings I realized that it was actually quite light, and comparing old and new recordings I could see the difference. I know he isn't a Baritenor, that's why I ruled that possibility out. HOWEVER, he most definately isn't a counter Tenor, at all. His tessitura isn't even that high plus his timbre isn't light enough. Now, he can BARELY even reach C natural let a lone a cake note like E5 which would be relatively easy for a counter tenor. You're FARRRR off with counter tenor. Counter Tenor would be Chris C from Glee. Justin Beiber is a LYRIC Tenor, he is no where CLOSE to a Counter Tenor. As of lately I've been having endless stamina when I belt but I can sing quite decently at low volumes but doing those dynamic crescendos around my pasagio slay me. Wanna hear some clips? When your technique is quite trashy no matter how countertenor you are, you're not gonna reach very high xD However, I didn't say he was a countertenor because I know you need to have a femenine voice like Chris Colfer does. Well, here is a song I wrote a few days ago (bored in class).... It shows the rest of my soundcloud too if you want to look at it. Sorry for not answering! I've been crazily busy these days preparing everything to go to college and I had no time to check the blog. Sound cloud works like a constant playlist. Just type in my name on the soundcloud search thingy (Black Robin).... Lol. It takes some getting used to buy I love it's quickness. He's 19 and still can't go below C3. If he ends up a baritone then Chris Colfer will end up as a basso profundo. Bruno Mars is a spinto tenor. Gary LeVox is the highest kind of tenor possible. There's no way Bruno Mars is a spinto tenor, he doesn't have thesize nor the power to be it. He's a light lyric tenor. No, not by a long shot. He is a light lyric tenor. He doesn't have the sound output or the timbre to be spinto.